“You want to see the Jewels of Jasper National Park!? I suggest you take two tours: one to the Columbia Icefields; and the other to Maligne Lake. 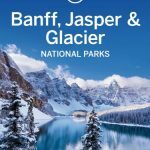 They are two gems set in one of the most beautiful spots on earth,” a resident of the town of Jasper advised when I asked him what were the most important sites to see during our four day stay in one of Canada’s most charming parks. I thought of these renowned attractions as we settled down in our luxury abode, the Fairmount Jasper Park Lodge, thrilled with its picturesque panoramic setting. 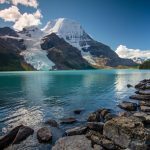 It was conducive for dreaming of travelling to the Columbia Icefields with their glaciers virtually as old as time itself and Maligne Lake, the charming jewel of Jasper National Park. Like most other tourists we began our vacation by exploring the mountain resort-town of Jasper, nestled in the bosom of the Rockies. Located 1,067 m (3,510 ft) high , it is an overgrown village of some 4,500 in winter and 10,000 in summer. The well-kept buildings, cuddled by towering mountains, have made it an idyllic vacation spot. 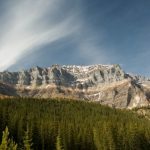 Its first-class tourist facilities make it easy for visitors to be comfortable and at the same time enjoy the many natural attributes of Jasper National Park. Restaurants, art galleries and a varied selection of shops cater to the thousands of tourists who crowd the town, especially in summer. Here, also, whatever the season, travellers can partake in mountain adventure and make contacts with the animals of the wild. From this neat-cosy resort, travellers usually begin their Icefields’ tour by driving through the heart of Jasper National Park to the Icefields, 103 km (64 mi) away. 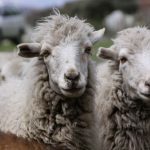 Soon they are surrounded by a vast world of unspoiled grandeur – 10,878 sq km (4,200 sq mi) of pine tundra, emerald lakes, deep canyons, rugged sky-reaching snow-capped mountains, tumbling waterfalls, large wildlife-filled evergreen forests and the Athabasca River – one of the most historic and beautiful rivers in Canada. Amid these endowments, tourists come in summer to enjoy the unspoiled hand of nature, in autumn to glory in a landscape of amber and gold, in winter to ski and in spring to admire the valleys of flowers breaking through patches of snow. Annually, these attributes draw some 2 million visitors from the four corners of the world. Making their way southward on Highway 93, known as the ‘Icefields Parkway’ and considered to be one of the most scenic routes in the world, travellers usually stop at Athabasca Falls to gaze in wonder at its roaring waters then further on at the Sunwapta Falls to watch the Sunwapta River tumble into a limestone gorge, a panorama of plummeting waters in a setting of white-tipped mountains and the tree-filled valleys. 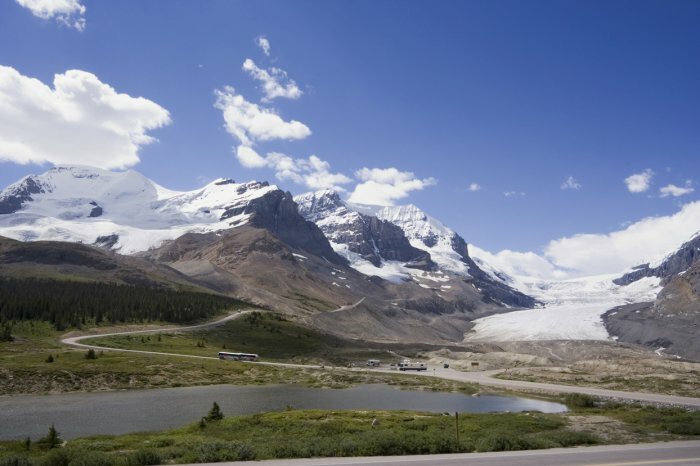 By mid afternoon the tour usually reaches the Columbia Icefields, a wonder of nature formed by six glaciers – the largest accumulation of ice south of the Arctic Circle. 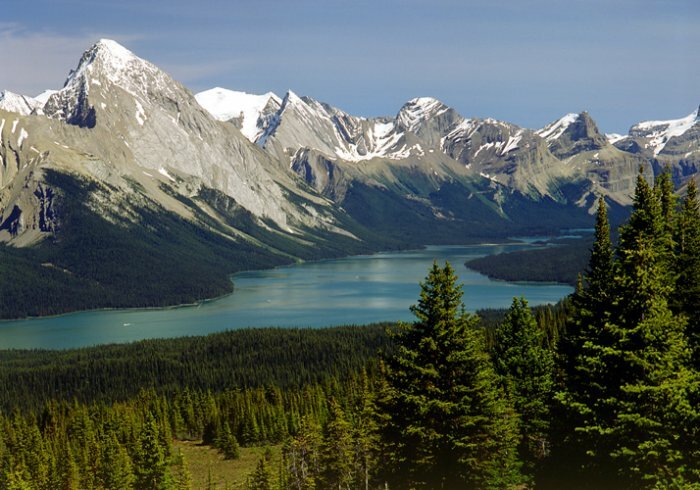 Edged by 11 of the 22 highest mountain peaks in the Rockies and covering an area of 325 sq km (126 sq mi) and averaging 3,000 m (9,840 ft) in height, the six glaciers form a true ‘Continental Divide’ – their waters pouring, via the Athabasca and South Saskatchewan Rivers, into three different oceans: north to the Arctic; east to the Atlantic; and west to the Pacific. The first stop is usually the Icefields Centre – a huge chalet-like stone building built to serve annually half a million visitors. Opened in 1996, the Centre houses exceptional interpretive exhibits and is located on a spot where one of the six glaciers, the Athabasca, is clearly visible. From its gigantic parking lot visitors can walk to the glacier’s edge and gaze at the enormous expanse of ice crevasses. Thousands of tourists take the Snocoach Tour onto the icy slopes of the huge glacier – 300m deep, one km and 6 km long. After a short bus ride, they are transferred to a 56 passenger Snocoach – a three ton vehicle not found any other place else on earth. Especially designed and built by a Calgary-based company for the Columbia Icefields, it takes the visitors to the middle of the Athabasca Glacier. Most of the passengers are often still snickering when the bus stops at the turn-around, below the glacier’s head wall. Here tourists are given a chance to walk atop centuries of accumulated snow, dotted with icy crevasses and ice-fed streamlets. After returning from the 90 minute Icefields’ exploration, visitors return via the Icefields Parkway to Jasper. The next day we ended our tours from Jasper by taking the serene Maligne Canyon and Lake Tour. Our first stop was in an area of a gorge formed by the Maligne River’s swirling and churning waters roaring from the lake, which have worn the soft limestone rocks in places 55 m (165 ft) deep. Located 11.7 km (7 mi) from the town of Jasper, it is one of the most spectacular gorges in the Canadian Rockies, incorporating an extensive above and underground river system. Continuing on our tour we stopped at the 7 km (4 mi) long Medicine Lake, which has no surface outlet, and disappears in autumn and winter through a series of underground channels, giving rise to the Karst topographical phenomenon – causing the lake to completely drain every year. We stopped by the Maligne Lake Day Lodge & View Restaurant from where there is a fine view of the lake and its surrounding white capped mountains – said to be the most famous view in the Canadian Rockies. The docks edging the restaurant (best dining on the shores of Maligne Lake), had a series of boats standing by, waiting for customers. After enjoying lunch, like the 40,000 annual tourists who visit the lake, atop its waters, we joined in a 90-minute scenic boat cruise to Spirit Island. 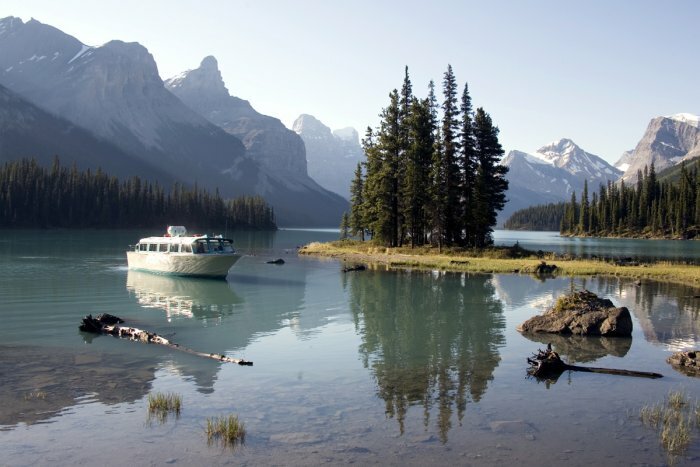 Known as the icon of the Canadian Rockies, Spirit Island, located on the southern end of the lake, is a small islet that is wrapped in legends and can only be reached by private boats or cruise vessels. The stop allows passengers to walk the island and stop at a viewpoint that offers a spectacular panorama of the lake and mountains. Our guide seemed to love his job as he entertained us with his historic and geographical stories about the lake intertwined with anecdotes and jokes. The scenery around us was eye-bulging and I continued to be entranced with the aura of lake waters caressing the feet of the majestic mountains until we docked on Spirit Island for a short stroll. With the departure from Spirit Island our exploration of Maligne Lake ended. We had come to see why within the Jasper area, there is no competition in the beauty of its setting. After our tour, the saying that ‘once you have seen it, Maligne Lake will forever hold a place in your mind’, seemed appropriate. 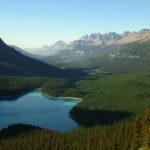 That night, comfortable in our 4-star Fairmont Jasper Park Lodge in the town of Jasper, I reminisced about our tour of the Maligne Valley and Lake. It had been a fulfilling experience. The sky-reaching mountains, colourful surrounding vistas, the colourful lake with its disappearing water and Spirit Island with its romantic legends all made the tour worthwhile and a destination anyone would choose more than once. The town of Jasper is situated about the same distance from Calgary and Edmonton, Alberta’s capital – about a five-hour drive. Both have excellent air, road and rail connections. Also, there are good rail and bus connections with Jasper. 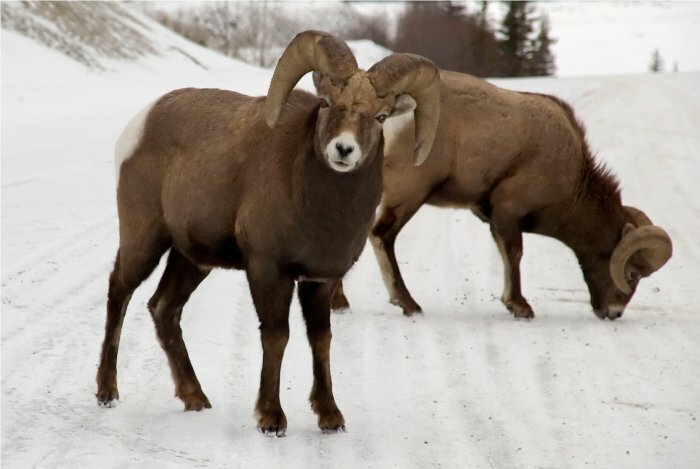 However, the ideal way to travel through Jasper National Park is to rent an auto and explore the park. The roads inside the park are excellent and the viewpoint sites are endless. In addition, there are excursions offered from both Calgary and Edmonton. Jasper Tramway, the longest and highest guided aerial tramway in Canada. 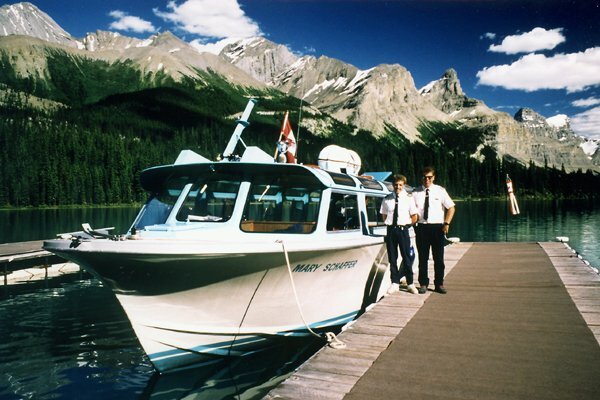 It transports one to Jasper National Park’s alpine tundra where there are unprecedented views, six mountain ranges, glacial fed lakes, the Athabasca River and the scenic town of Jasper. Miette Hot Springs, about 60 km (37 mi) east of Jasper. At 53º C, they are the hottest mineral springs in the Rockies. However, their waters are cooled to 40º and chlorinated for bathers. Pyramid Mountain and Pyramid Lakes, just 8 km (5 mi) from the heart of town, it is well worth the trip just to view the beauty of the two lakes in the shadow of the towering Pyramid Mountain. 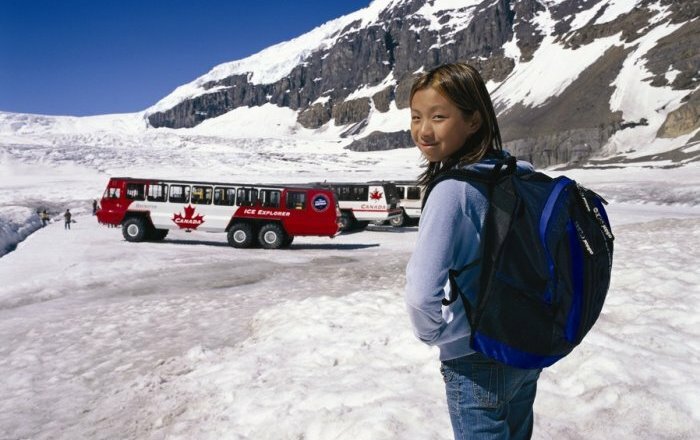 The Columbia Icefields Tour from Jasper – cost $129. Toll Free: 1-800-565-7547. 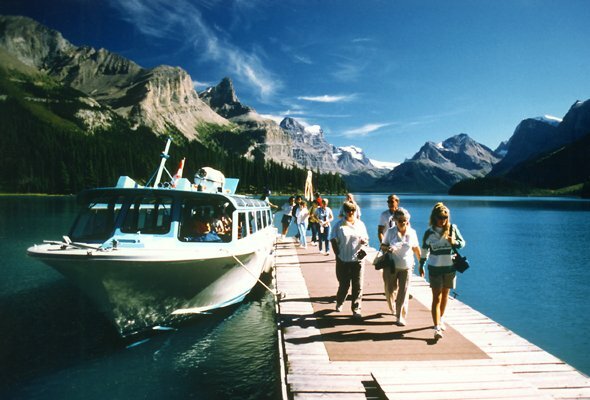 Maligne Tours Ltd., specialize in tours to the Maligne Valley, Canyon and Lake – cost with boat cruise $103.95.